Venerable Pema Dorjee leads a meditation in the Tibetan Buddhist tradition. 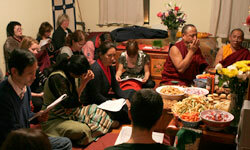 This class includes meditation and chanting of prayers. Venerable Pema Dorjee directs this class towards a more formal and deeper understanding of the teachings of Lord Buddha and the Buddhist philosophy. Following the teaching is a session on meditaion and preliminary practice with prayers and mantras. All classes are held at our center located at 110 1st Ave, 5th Floor in Manhattan. Please press "5" on the buzzer. There is no fee to attend the classes, however donations are always welcome. Students and practitioners at all levels are welcome.